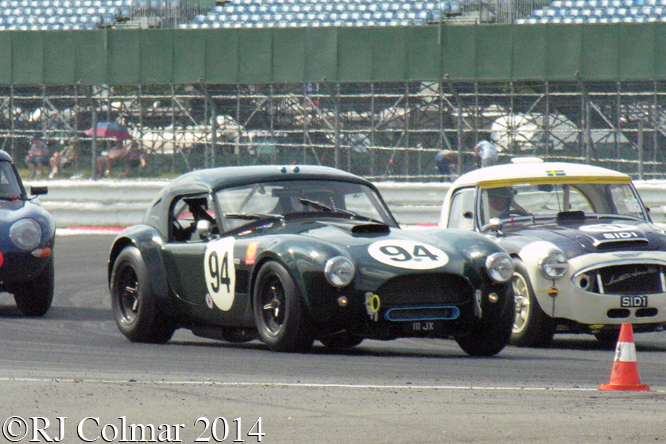 For today’s Americana Blog I thought it would be fun to look at some of the US powered pre 1966 GT cars that took part in the 50 minute Chopard International Trophy at Silverstone Classic a couple of weeks ago. 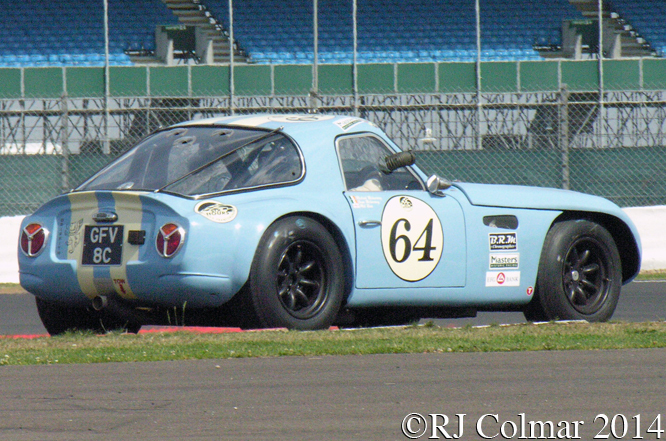 Fastest of the seven 289 cui Ford V8 powered AC Cobras in the race was the 1963 #94 example driven by Micheal Gans and Andy Wolfe which came home in 4th place. 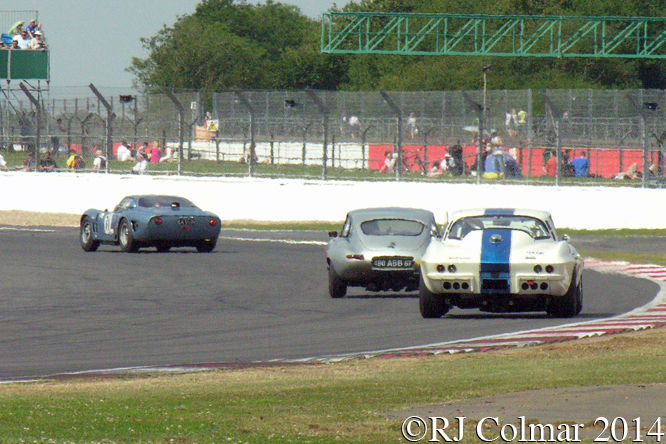 One place further back at the finish was the blue 327 cui Chevrolet V8 powered 1965 #71 Bizzarini 5300 GT driven by Roger Wills, seen above heading an Jaguar Coupé and Craig Davies’s Corvette Stingray. Jamie McIntyre drove the fastest of the two Chevrolet 327 cui Iso Griffo A3C’s in the race to a 12th place finish, he is seen lapping the 1963 #118 Aston Martin DP214 driven by Robert Rawe above. 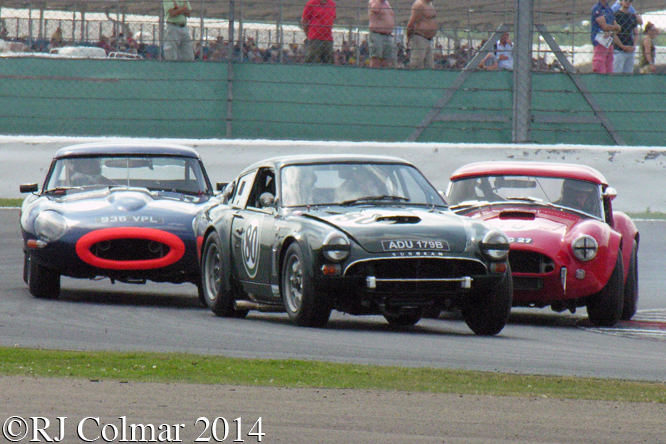 Driving a genuine Le Mans bodied 259 cui Ford V8 powered Sunbeam Tiger to a 24th place finish were Chris Beighton and Tony Ekford, seen above ahead of an Jaguar E-Type and AC Cobra. 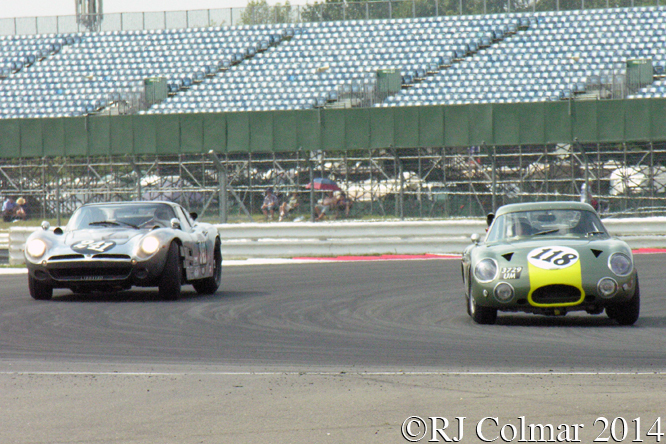 Winner of the Chopard International Trophy was Sean McInerney in the 289 cui Ford V8 powered 1964 #64 TVR Griffith seen above. Thanks for joining me on this “US Powered European GTs” edition of “Gettin’ a li’l psycho on tyres” I hope you will join me again tomorrow. Don’t forget to come back now ! This entry was posted in Uncategorized and tagged 5300 GT, A3C, AC Cobra, Beighton, Bizzarini, Chevrolet, Chopard International Trophy, Colmar, Ekford, Ford, GALPOT, Gans, Griffith, Griffo, Iso, Le Mans, McInerney, McIntyre, Ralph, Silverstone Classic, Sunbeam, Tiger, TVR, Wills, Wolfe on August 14, 2014 by Ralph. For 1935 Ernesto Maserati devised the V8RI challenger for the 750kg / 1653.47 lbs formula to take on Mercedes Benz, Auto Union and Alfa Romeo, the latter entries managed by Enzo Ferrari, for honours in the top echelon of motor sport known as the European Championship which comprised just five events. 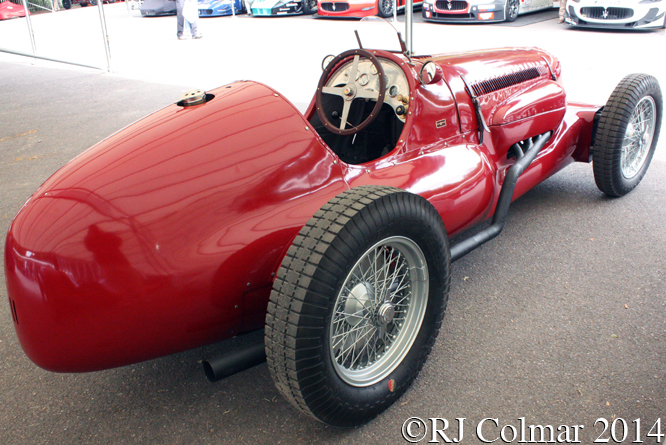 The V8RI broke with Maserati tradition being the first car to run a motor in anything other than an inline configuration and further more it was the first Maserati motor not to feature twin overhead camshafts, Ernesto opting for a single overhead camshaft per bank of the 300 hp 4.78 litre / 292 cui supercharged V8. 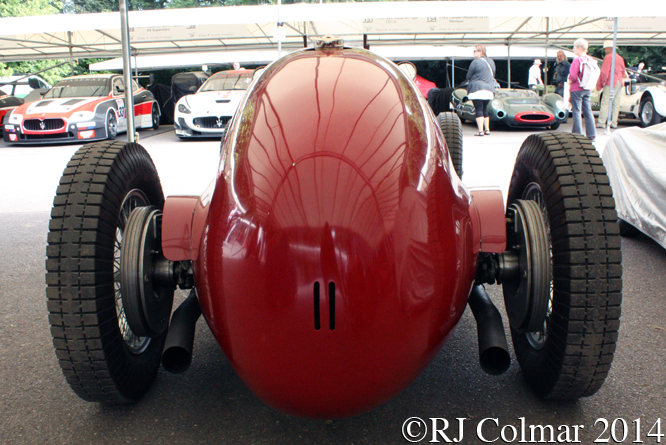 The V8RI was also the first Maserati to feature, ruote indipendenti, independent suspension for all four wheels. The transmission and differential were designed as a single transaxle unit. 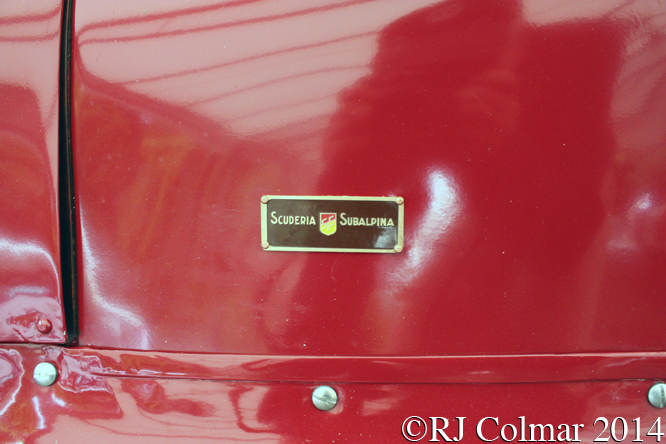 Being essentially funded by private entrants in particular Scuderia Subalpina it is perhaps not surprising that the first V8RI to appear, today’s featured chassis #4501 did not show up until midway through 1935 and then only at the non championship XI Grand Prix de la Marne where Phi Phi Etancelin placed second in Heat 1 and retired with a blown motor from the final. The VR8I’s first European Championship appearance was at the penultimate round at Monza where Giuseppe Farina ‘won’ pole position which was drawn by lot, only to non start VR8I #4502 because of a recalcitrant motor. Phi phi completed 14 laps of the Italian Grand Prix in #4501 before crashing out and sustaining injuries which would keep him out of the cockpit for at least one race. Farina made one further non championship start in a VR8I in 1935 at Circuito di Modena, but he retired after 7 laps with a fuel tank issue. 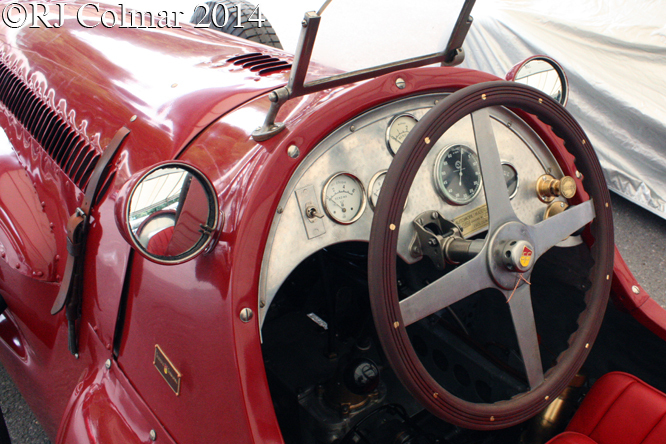 Over the winter on 1935/36 Scuderia Subalpina became Scuderia Torino and Gino Rovere the teams patron took a controlling interest in Maserati. For 1936 both Phi phi Etancelin and “Raph” bought V8RI’s to run privately and Phi phi scored the V8RI’s most important European result by winning the 1936 Grand Prix de Pau against a field of Alfa Romeo’s and Bugatti’s which were not considered serious challengers to the absent front line contenders from Auto Union and Mercedes Benz. From 6th further starts in his private V8RI Phi phi finished just once in the Vanderbuilt Cup race at Roosevelt Raceway where he finished 9th. Coincidentally from the results available to me this was the first and only time in 1936 where ‘Raph’ raced his private V8RI being disqualified for a push start on lap 9. 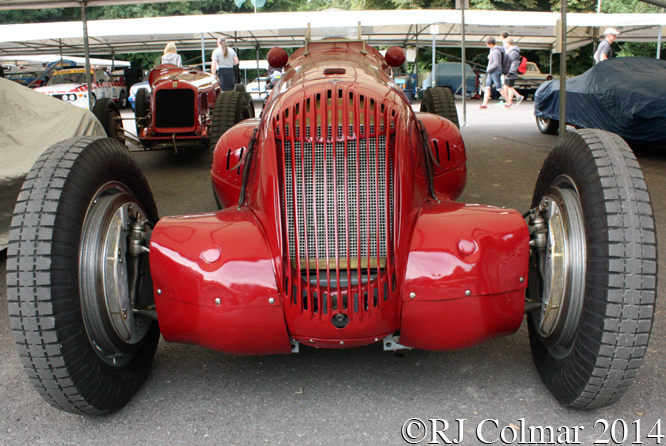 The works / Torino V8RI’s are known to have appeared on five occasions in 1936 with an only finish of 7th place for Count Felice Trossi and Ernesto Bianco at the Italian Grand Prix. 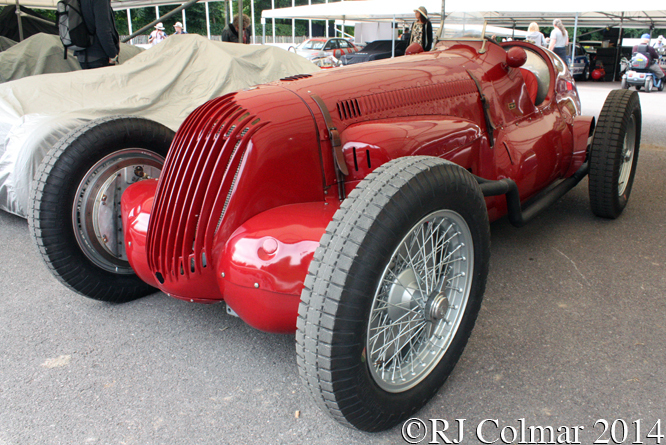 This result helped Trossi finish 7th equal in the 1936 European Championship with Alfa Romeo’s Antonio Brivio and Auto Union’s Ernst von Delius, Trossi’s other finish in a 4C Maserati came at the German Grand Prix where he shared 8th with Richard Seaman after the Englishman’s Torino V8RI retired with brake issues early in the race. 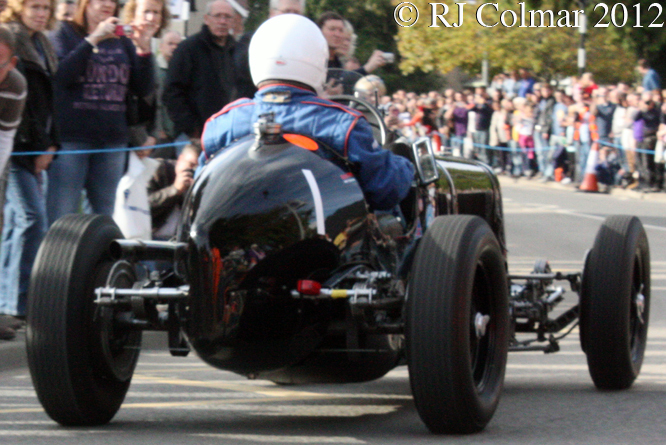 #4501 was modified in 1936 with attention given to the independent suspension and transaxle but from the results available to me it never appeared at any races with these modifications. 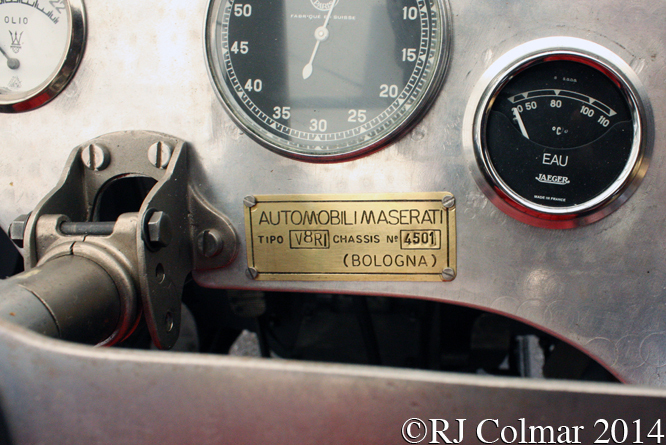 In 1937 Maserati withdrew from the European Championship, which was dominated by German machines producing over 500 hp. Alfordo Mandirola drove his privately entered V8RI in at least two non championship events in Europe in 1937 scoring a best 7th place in the Grand Prix Valentino run in Turin. Later in 1937 all four V8RI’s were entered in the Vanderbuilt cup race, #4501 to be driven by Deacon Litz however was the only V8RI not to show. Wilbur Shaw finished 9th in the race driving a V8RI while the other two V8RI’s retired. With a reduced engine capacity and the supercharger removed #4501 appeared at the 1939 Indianapolis 500 where both Deacon and rookie George Robson failed to qualify the car. Deacon however qualified another V8RI, which also featured a modified body, 31st and finished 33rd after a couple of dropped valves brought his race to a halt on lap 7. Jim Brubaker, from Pennsylvania bought #4501 and between 1946 and 1949 it failed to qualify for the Indy 500 four more times. In October 1950 Phil Cade became the owner of #4501 and he competed with it on the East Coast in circuit races and hillclimbs from 1951. Somewhere between 1952 and ’53 Phil fitted a Chrysler Hemi V8 and continued competing with the car in this form until 1960, among Phil’s successes was winning the Watkins Glen Seneca Cup in 1958. 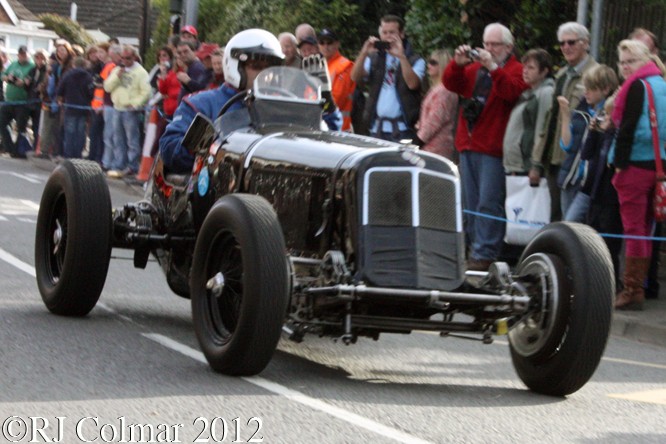 In 2003 Bob Valpey bought #4501 from Phil and reunited it with it’s Maserati V8 motor. #4501 currently belongs to Michael Gans who completed an eight year restoration of the car prior to the Goodwood Festival of Speed where it is seen in these photographs. My thanks to historian Adam Ferrington, #4501’s owner Micheal Gans and the numerous Nostalgia Forum contributors who unwittingly contributed to this post on various threads of the forum. Thanks for joining me on this “Ruote Indipendenti” edition of “Gettin’ a li’l psycho on tyres” I hope you will join me again tomorrow. Don’t forget to come back now ! 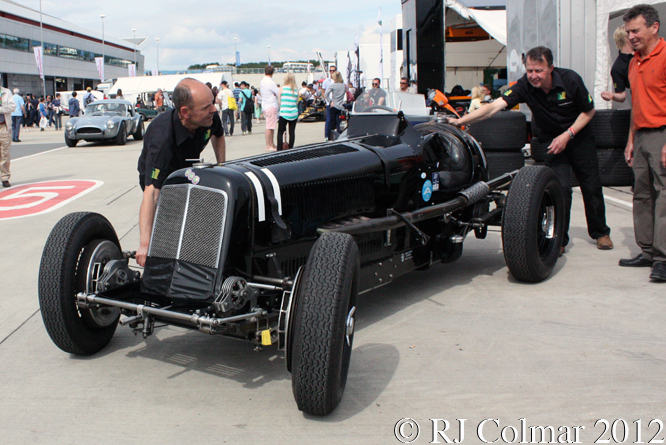 This entry was posted in Uncategorized and tagged Bianco, Brubaker, Cade, Chrysler, Colmar, Etancelin, Farina, Ferrington, Festival of Speed, Gans, Goodwood, Indy 500, Litz, Mandirola, maserati, Pau, Psychoontyres, Ralph, Raph, Rodson, Rovere, Scuderia, Seaman, Shaw, Subalpina, Torino, Trossi, V8RI, Valpey, Vanderbuilt Cup, Watkins Glen on July 21, 2014 by Ralph.